The Static Meter I measures charges according to the fieldmill influence principle C: The influenced charges, caused by electrically field, generate an alternating current proportional to the electrical field strength. The selective amplifier converts this value into the corresponding field strength or electrical potential – without withdrawing energy from the electric field over the averaged time. Electrostatic charges always occur where highly insulating materials, such as most plastics, are used. The resulting field patterns, such as A and B, are easy to be evaluated theoretically, but they are of minor interest to the practician. For the latter it is important to know the level of these electrostatic charges and the spot in the machine of facility where they occur. Therefore he should have specific devices at his disposal to measure these interfering charges. Variable measuring distance: In order to obtain optimum results, the distance between test object and sensor head – depending on the degree of charge and the condition of the objects’s surface – can be selected incrementally. Display in Volt: The integrated micro-computer automatically converts the measured field strength into the equivalent charge in Volt. The electric field of the electrostatic charge is converted into a measuring alternating current through the cyclical covering of the sensor plates. The display shows a tension proportional to the intensity and polarity of the field to be measured. Field strength meters are working according to this principle have a high measuring sensitivity and allow very accurate measuring. 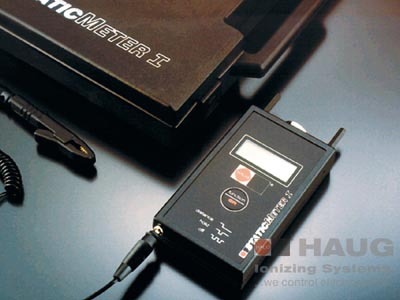 The use of the Static Meter I can be precautionary measure in all manufacturing processes, where electrostatic charges may occur. However, this device is not approved for use in hazardous locations! Balancing within the homogeneous field of a plate capacitor, plate size 100 x 100 mm. Distance between plates 20 mm, Measuring device built in the center of the pasted plate.